Text, photograph and drawing copyright © by John Northall. Camrose was a small but powerful motte and bailey built in a strong position at the side of a small river where it controlled the ford. It was a subordinate castle to Haverfordwest and was built early on during the initial Norman thrust into west Wales, before Pembroke was established, in around 1080. It was part of the Landsker line of castles that stretched from Llawhaden to St Davids and can be seen on the sketch map provided for Hayscastle. 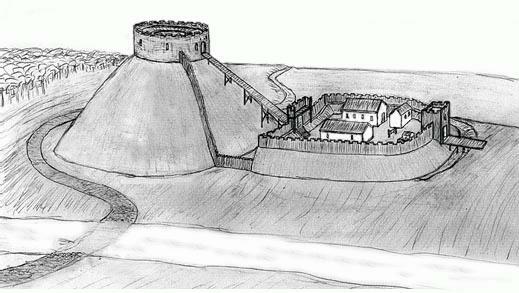 Below: a sketch of how Camrose Castle may have looked in the early 12th century. King William the Conqueror stayed overnight here during his pilgrimage to the ancient holy site at St Davids ( 2 pilgrimages to St Davids were counted as being the equal of 1 pilgrimage to Rome, such was the difficulty of the journey in this wild and foreign land). It's not clear how long the castle was in use but it was upgraded at some time by the construction of a stone wall around the top of the motte, as at Wiston, so the site must have been of some importance. The motte is now badly overgrown and the bailey is out of sight above the level of the road. Sadly, the site is largely ignored but the enthusiast will be rewarded with a good example of the classic motte and bailey castle, should they make the effort to seek it out. The motte still stands to its original height but it suffered landscaping in the 18th century when the landowner converted it into a folly. If you look carefully at the photograph you can see the base of the finely contructed stone wall which runs around the top of the motte, apparently to form a shell keep. The 3 to 5 courses that are left are revetted into the side of the motte's top. 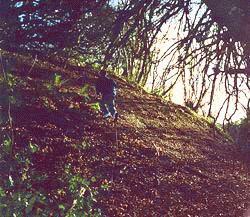 The bailey is separated from the motte by a minor road that runs through the castle's defensive ditch. It is still recognisable to the initiated but its banks have been somewhat eroded over the last 900 years. The possible existance of a shell keep seems to have been entirely overlooked by historians, perhaps because they believed it to be part of the folly walling erected 200 years ago. However, the quality of the masonary is very different to the crude revetment walls that line the footpaths lower down the side of motte; it is very similar to the style of masonary used in other castles in west Wales, such as Haverfordwest and Llanstephan. The OS map grid reference for Camrose Castle is 926198.